Custom Made duvet covers - ideal as a gift for special birthdays, weddings, or other family occasions. Individually order YOUR Penduka piece! Penduka creates truly unique products made for you only, such as a custom made story duvet cover, created specifically according to your wishes. A hand-embroidered one-off piece, also great as a present, e.g. for special birthdays or weddings. 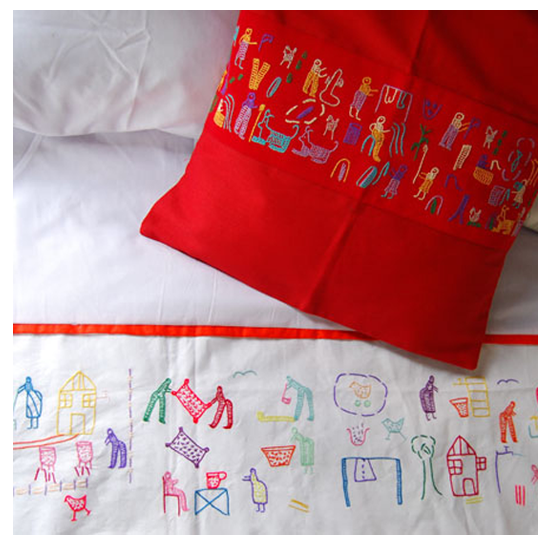 We also offer matching sets of individual products such as curtains and cushion covers, table runners, aprons and other products with your own hand embroidered design. Once we get your order, we will be in touch to receive your individual comments on color, size and any other specifics like an A4 paper size with supporting pictures and your story. 100% cotton, machine-washable, size 140cm x 210cm, or any other size, price depending on size and complexity, between 150 - 400 Euro, maximum 3 months delivery time. You may want to write your individual story on an A4 in English if possible and add some supporting pictures to it.